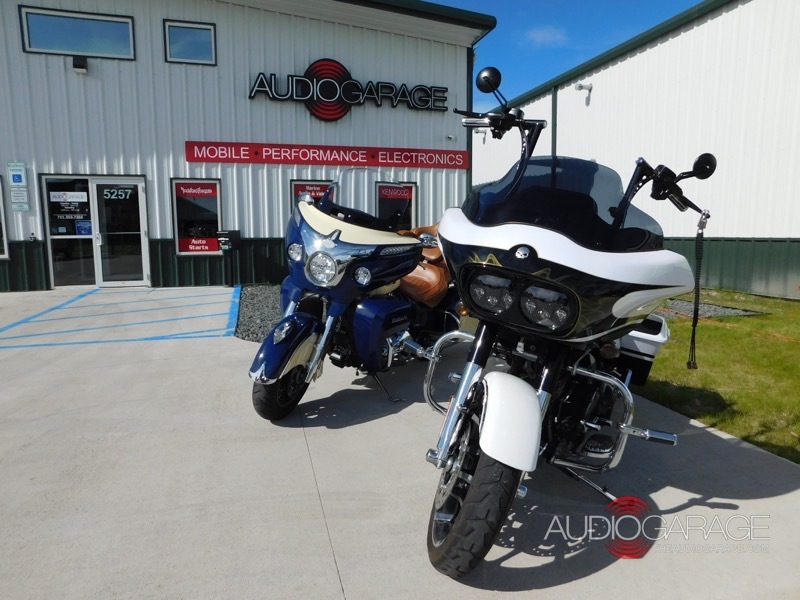 A client from here in Fargo recently contacted the team at Audio Garage about upgrading the audio system on his 2016 Indian Roadmaster motorcycle. We had worked on his Mercedes-Benz earlier and he was very happy with the results. He wanted the audio system on the Indian to play louder and sound better. 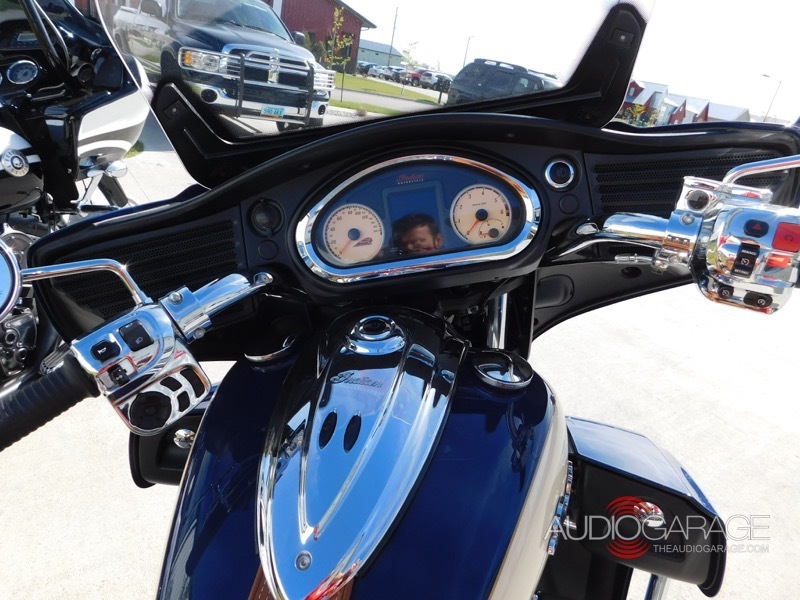 Since the work would be less common than on a Harley-Davidson, we agreed to investigate the sound system and create an upgrade that would offer the performance he wanted. After some analysis we determined it was possible to keep the factory radio. We wanted to work with the factory radio, so we started the upgrade process by measuring the signal coming out of it to see whether it would be suitable for driving new speakers through an upgraded amplifier. 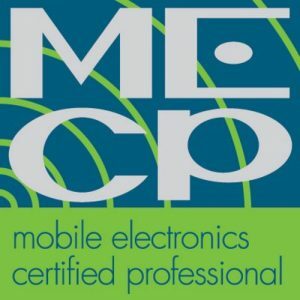 Our testing showed that the frequency response was on par with some of the new Ford F-150 radios we’ve seen. As such, we added frequency-compensated loads to the outputs of the radio and connected those to the new amp. The saddlebags proved the perfect place for mounting the amplifier. We planned to upgrade the front and rear speakers with high-quality, weather-resistant speakers and power them with a Rockford Fosgate TM400X4 Power-Series amplifier. With no extra room available in the front fairing, we mounted the compact amplifier in one of the saddlebags. As you can see, all the wiring for the amp is protected with automotive-grade cloth tape to keep the wiring neat and prevent buzzes and rattles. The quick-connect terminals on the amp allow the wiring to be removed quickly and easily if the bag needs to be removed to service the motorcycle. 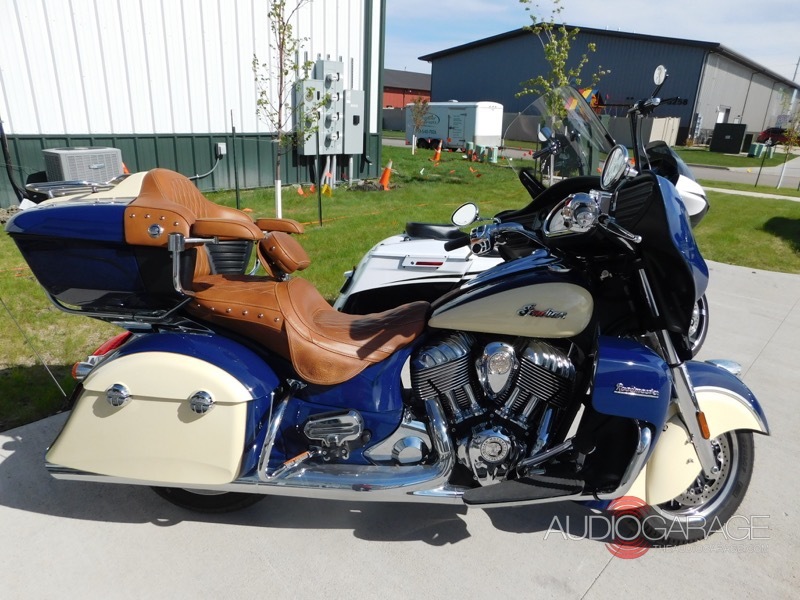 This great-looking Indian now has a great-sounding audio system. 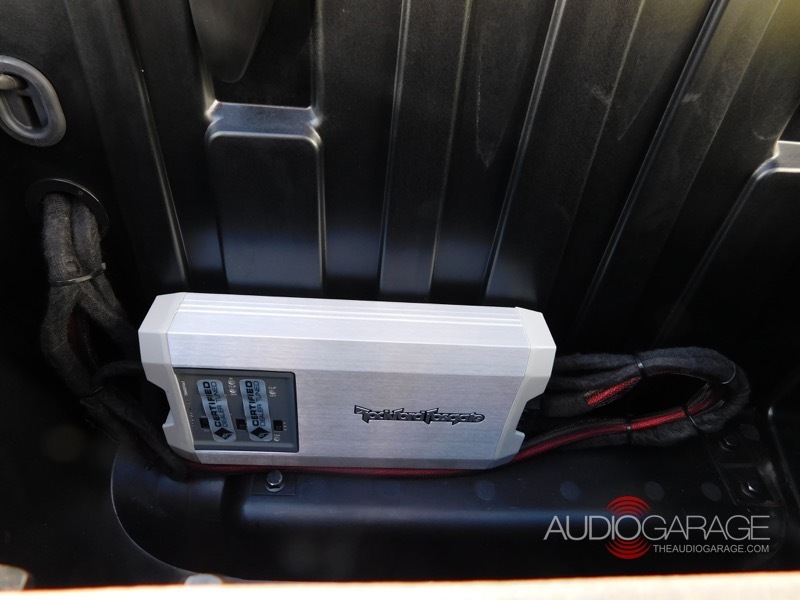 We choose Rockford Fosgate TMS5 speakers for the Roadmaster. The 5.25-inch coaxial speakers are designed for Harley Tour-Pak enclosures but fit perfectly into the Indian. 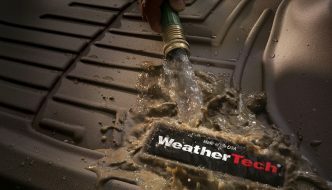 The TMS5 features Rockford’s Element-Ready design, with dirt, dust, water and UV resistance to ensure they will perform reliably for years. The TMS5 speakers include a 25mm tweeter to provide clear and detailed high-frequency response. The woofer is powered by a large 35mm voice coil to ensure great power handling so the client can listen at high volume levels without fear of damaging the speakers. The owner of this bike will now be able to cruise with all his favorite songs. 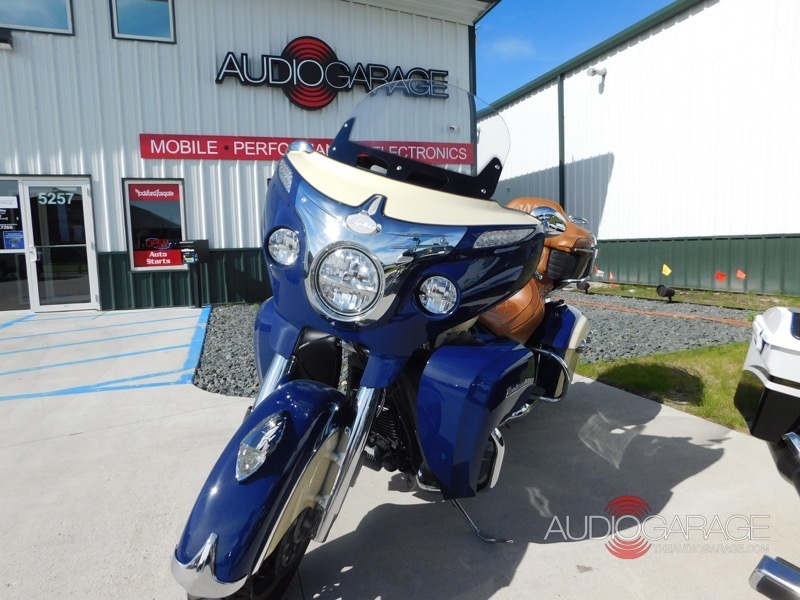 With the audio equipment integrated into the client’s Indian Roadmaster, the last step was to configure the amp to work with the new speakers and the factory source unit. 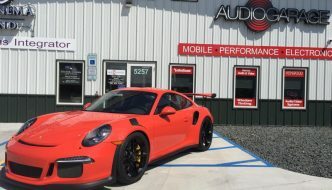 The client returned to Audio Garage to check out the new sound system and was thrilled with the upgrades we made. The music was clear, and the system played at the volume levels he wanted. 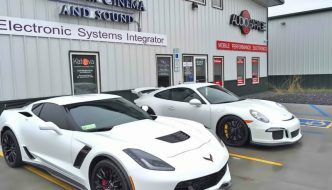 If you are in the Fargo area, drop by our store to find out how we can make your stereo system sound better. You can also reach us by e-mail if you have any questions.